Here is the original post on some famous photographers and how they went about selfies. It is harder than it looks. There is the vanity attraction of seeing images of yourself, but there wasn’t much else I found interesting in the images. Being a good subject or model is difficult. There is also the lack of being able to “see” most compositions prior to developing the film. The level of difficulty is multiplied for me. The first images explored simply recording me in a place I liked… The first image is outside the gallery where the Ho Fan exhibition was being held. It was a random studio on a lonely floor of a relatively isolated industrial building. I had ventured a long way out of my normal comfort zone to get there. I set the camera to the minimum aperture (F22 or F16?) to extend the exposure and blur me a little in contrast to the background. Wanting to get some sense of movement into the shot, I kept flicking through my notebook during the exposure. The second is a blog post style shot that simply provides a momento of my visit, with the Ho Fan images framed behind me, whilst talking to Sarah, his agent. To provide some interest, I made sure to stay as steady as possible whilst other subjects kept moving. It is an interesting contrast – one which might be worth exploring further. The final image of the set uses Champagne Court as the location. Almost qualifies as a tourist selfie or brag shot. “Here I was!” kind of thing. I have no idea what expression or pose to take, nor what to do with my hands. I look very stern and apart from the location, there is not a lot happening. The left image is a standard selfie stick shot. It was difficult to frame the shot using a film camera… No chimping possible to adjust the angle and re-shoot! Again, I don’t have a creative purpose in mind, and the image reflects this. The image on the right was a “rest it on the table” and set the timer shot. A lot like the first three, but cropped in closer. I was also able to frame the shot prior to taking it, so I had a rough idea of how it might work. 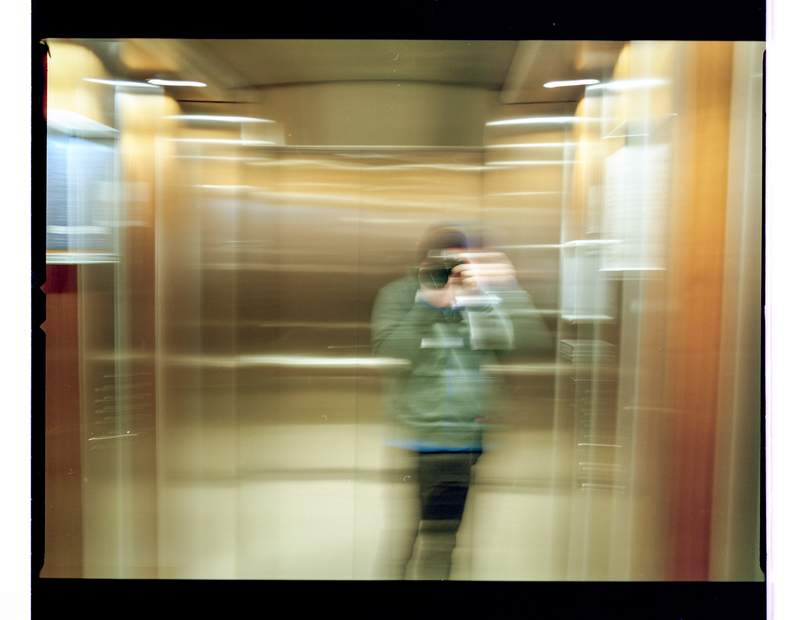 The next image was a simple exploration of reflections in an elevator, whilst in SA. The first image I took (not shown) was sharp and motionless. For the second, I moved the camera during the exposure to give it some motion. It is OK, but feels a bit gimmicky? Again, it was more an exploration of a technique rather than a conscious creative project. 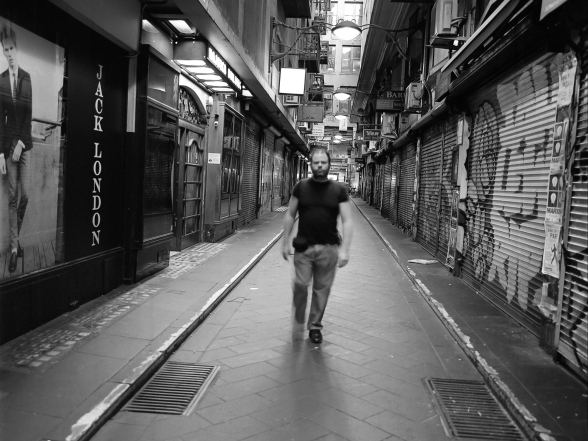 The next morning in adelaide I went out before dawn to try my hand and some Trent Parke style edge lit flash shots. Whilst none of them really turned out the way I wanted, I had a crack at another reflection selfie. The image looks ok once it is cropped in close, and works much better in square format. The flash worked nicely, giving it an ET’s heart kind of thing. The final two were an exploration of silhouettes. The left shot works well from a strict composition perspective – there are plenty of diagonals, triangles, and three human shapes in a line – but the image kinda lacks a bit of soul. Technically, it is a little bit clever in the composition, but doesn’t interest me as much as I would have hoped when I spotted the composition frame around the IFC building in Hong Kong. The image on the right was composed using the timer and a flat surface. Struggled again to work out what to do in the image, but figured an outward looking ruckenfigur was as good as anything. The light is funnelling in from the street into the poorly lit alley. There is a question around what the subject (me) is going to do next – the image has a feeling of suspense around it, and a reasonably assertive stance. There are some great colours and textured lines on the wall behind. This is the image I am happiest with. I have a new found respect for photographers who can consistently produce interesting selfies. Selfies still need a creative objective. It is not enough to simply take photos of yourself, without any kind of theme or message to hold the composition together. Not being able to look through the viewfinder at the moment the film is exposed forces you to consider the composition of the image more proactively and consciously.